The Great Salt Lake is considered one of the natural wonders of the world. It was discovered by fur trappers in the 1820's. The early explorers first thought that it was connected to the ocean because of the salty taste. Little did they know that in actuality it is generally four to five times saltier than the ocean and during drought years from six to eight times saltier than the ocean. The Great Salt Lake is salty because its waters are not drained by outflowing streams and rivers. The Dead Sea is the only body of water that has a higher salt content. The Great Salt Lake covers approximately 940 square miles (2,435 square kilometers) and is about 75 miles (121 kilometers) long, 50 miles (80 kilometers) wide. The elevation is 4, 195 feet above sea level (1,279m). The deepest point is 27 feet (8m). Mining companies have extracted sodium chloride (salt), magnesium, lithium, chlorine, gypsum, potassium sulfate and sodium sulfate from the lake waters, which yield up to 27% solids. The northern arm of the Great Salt Lake contains the highest mineral concentrations. The lowest level of salt content is found on the south and east sides where the river inlets feed into the lake. An indepth Utah Geological and Mineral Survey by the University of Utah (Bulletin 116, 1980). It was concluded that, "The Great Salt Lake has been concentrating mineral salts in its waters for thousands of years. However, the total soluble concentrations of heavy metals in the water are extremely low. The heavy metals in the lake, along with clays, organic materials and carbonates are precipitating to the sediment sand and deep brines where anaerobic conditions and sulfides formed by sulfate reducing bacteria immobilize the metals. The lake thus avoids accumulation of heavy metals in the waters and is non toxic and self-cleaning. " The Great Salt Lake is believed by scientists to be the largest lake left of a huge fresh water lake thousands of years ago. This fresh water lake was called Lake Bonneville by geologists. 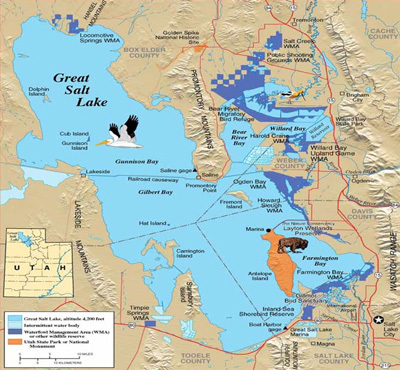 The Great Salt Lake today is the largest natural lake west of the Mississippi River. There are no fish that live in the Great Salt Lake because of the high salt content, but tiny brine shrimp does live in the waters and they are the reason for the bad smell. The tiny brine is processed today as a tropical fish food. A tiny fly also lives in the water during its grub stage. It has been suggested that swimming is not recommended in the Great Salt Lake because of the high salt content of the water. There are those who learn this the hard way after they go under the water. They usually come up for air with burning eyes, nose and throat. It is best to relax and just float in the water. It is a fascinating sensation to simply float and try to sink.